Giving pleasure can be so easy - whether for congratulations, as a thank you, for a birthday or simply as a surprise. In these and in many other instances, gift cards are the ideal alternative. with any value. For this kind of giftcard please contact directly our costumer service 0800 700 710. Card value cannot be payed out in cash. No interest is paid on card value. Should the card be lost, stolen or damaged, the card will not be replaced. 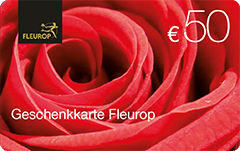 The general terms and conditions of Fleurop Interflora Austria GmbH apply. 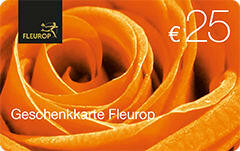 Fleurop gift cards can be purchased at Fleurop partner shops in Austria, online and by e-mail ([email protected]). You can redeem Fleurop gift cards either online, towards any online order on fleurop.at, or directly in-store, at over 300 Fleurop Florists throughout Austria..